The superb pagodas of Cos d'Estournel sit on the heights of Saint-Estèphe. Louis-Gaspard d'Estournel, known as "The Maharajah of Saint-Estèphe", inherited this estate. Founded in 1811, the estate is located on the Cos hillside and was gradually shaped by this visionary who went to the four corners of the world to bring his wine and to win new customers. Even today, the estate benefits from a terroir of great complexity and incredible richness. The 91-hectare vineyard is made up of a mosaic of 61 parcels that is planted with two-thirds Cabernet Sauvignon and the rest completed with Merlot, and a small proportion of Cabernet Franc and Petit Verdot. 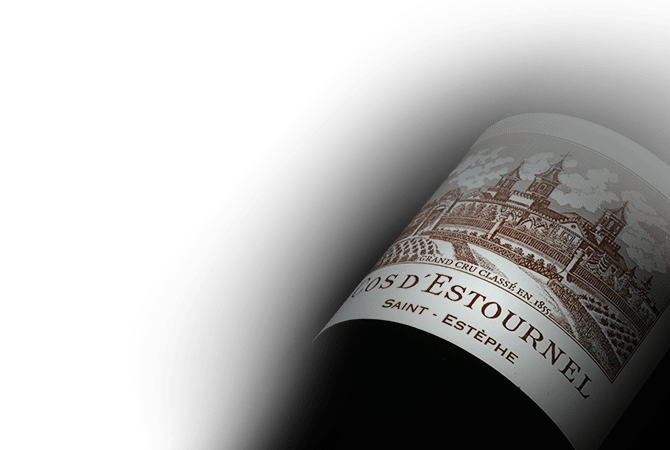 Since 2000, Cos d'Estournel, a Second Classified Growth of 1855, belongs to Michel Reybier. Anxious to continue the work of its founder and take a decisive technical lead, he constructed the first vinification cellar with a gravity system in 2008. From the reception of the harvest to the bottling, the whole process takes place without a single pump. This avoids excessive handling of the juice. This new technology is part of a quest for excellence in the field and it allows the handling of grapes with a greater respect. From the great terroir of Cos d'Estournel come three wines: Grand Vin Cos d'Estournel, Pagodes de Cos and Cos d'Estournel Blanc.